6/23 Cup of Coffee: The last of the Red Sox affiliates got their season started on Monday, as the Gulf Coast League squad used a 13-hit attack to win on opening day. Strong pitching and a late offensive burst kept Lowell undefeated, while the DSL teams split their contests. Pawtucket and Portland were also both in action, with both teams falling by one run. With Justin Masterson finishing up his rehab assignment last week, the PawSox turned to Zeke Spruill to make his first start as a member of the organization. A starter during much of his time with Arizona, the right-hander turned in a solid spot outing, allowing a run on four hits in five innings of work, striking out a pair without issuing a walk. In his fourth appearance since being activated from the disabled list, Edwin Escobar took the loss, giving up two runs on three hits in two innings. Jonathan Aro and Matt Barnes turned in one scoreless inning apiece. The offense managed only five hits off a quartet of Red Wings hurlers. Jackie Bradley Jr. was 1 for 3 with a walk and a run scored, and Luke Montz delivered the only extra-base hit, a sixth-inning double. All eyes were on Manuel Margot, who was promoted earlier in the day and was promptly given the start in center field and inserted into the number six spot in the lineup. The 20-year old singled on a bloop to right to lead off the second inning in his first Double-A at bat. Reading was able to keep him at bay the rest of the evening, however, retiring him in his next three plate appearances. Marco Hernandez was on base three times out of the leadoff spot, going 2 for 3 with a walk. It was the seventh multi-hit game in June for Hernandez, who is hitting .333 on the month. Heri Quevedo took the loss, allowing two runs on seven hits in 4 1/3. The Spinners' undefeated record was in jeopardy, as they were trailing 1-0 heading into the seventh. However, the bats came alive with six runs on seven hits in the final three frames. The offensive outburst supported a strong 2015 debut from Jose Almonte. The 19-year-old righty, signed to a $610K bonus out of Dominican Republic in 2012, allowed a run on only two hits in a career-high six innings. Almonte struck out five and walked only one. Edwar Garcia was solid in relief, scattering four hits across three scoreless innings to get credit for the save. Jeremy Rivera continues his hot start, going 3 for 4 with a walk. The shortstop has now reached base 10 times in his first three games of the season. Bryan Hudson was 2 for 5 with a run scored, and ninth-round pick Tucker Tubbs doubled for his first professional extra-base hit. The Gulf Coast Sox kicked off their season firing on all cylinders, pounding out 10 runs on 13 hits. Leadoff hitter Luis Alejandro Basabe (pictured) was unstoppable out of the leadoff spot. The second baseman reached base in each of his six plate appearances, going 3 for 3 with two walks and a hit-by-pitch. Basabe also doubled, scored three runs, and drove in one. Carlos Tovar scored twice during a 3-for-5 afternoon, while Trenton Kemp and Tyler Hill added two hits apiece. Henry Ramos also made a rehab appearance, his first game appearance since tearing cartilage in his knee on April 15. Javier Rodriguez got the nod for the opening day start, and the lefty got the win, giving up two runs on three hits in five innings. He walked five and struck out one. Algenis Martinez gave up an unearned run in his inning of work and Pat Goetze also allowed one run in his one-inning outing. Trevor Kelley, a 2015 draftee out of North Carolina, struck out three in two scoreless innings to close out the victory. The Red Sox1 squad snapped its six-game losing streak on Satuday, but found itself back in the loss column on Monday afternoon. Starter Alejandro Rodriguez took the loss, allowing two runs on seven hits in 4 1/3 innings. Eduard Conde provided one of the few offensive highlights, as the second baseman broke out of a 0-for-33 skid with a two-hit afternoon. The Red Sox2 team seems to be having none of the offensive struggles that their counterparts are. The team delivered 15 hits, including four for extra bases. Juan Barriento slammed his third home run of the season, a two-run shot in the seventh. Lorenzo Cedrola was 3 for 5, and Rafael Toribio extended his hitting streak to nine games with a double. That was plenty of offense for starter Yorvin Pantoja, who allowed a run on four hits in five innings to earn his first professional win. Pantoja struck out five and walked a pair. Angel Padron and Jose Gonzalez tossed two scoreless innings apiece out of the bullpen to close out the victory. Player of the Day: It was quite a 2015 debut for Luis Alejandro Basabe, who was making his first appearances stateside after playing the last two seasons in the Dominican Summer League. 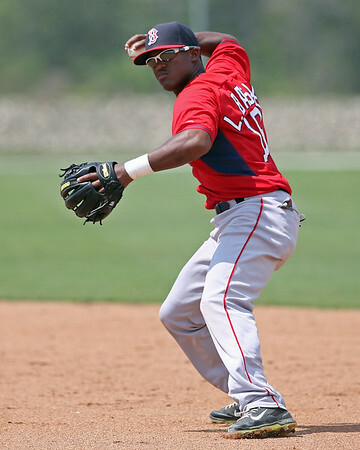 The twin brother of Luis Alexander Basabe of Lowell, Luis Alejandro scored three runs and reached base six times as the GCL Red Sox romped.